The eTeacher Group is one of the largest online language academies in the world. It offers language instruction from verified, native speakers including Hebrew lessons. The company has passed thousands of students through its language courses and supports users from all around the world. To simplify the process for students and teachers, all instruction is done in Hebrew. This means your classmates may be from many other countries but all will be speaking with you at the same Hebrew level to help you learn. This service is built for people that are committed to making classes because the instruction relies mostly on them and you pay for classes, whether or not you attend them. eTeacherHebrew combines pre-made lesson plans and learning materials with live instruction from live, certified teachers in a virtual environment. Courses are offered at multiple times of day during the week and on Sundays. Students are able to choose the time of their class when they signup. Classes meet once a week over an 8 or 9 month timeframe and each class is 55 minutes long. The service also offers enrichment sessions each week for Q&A or homework help. The teaching method is called Ulpan and was first used when Israel was created in 1948 in order to teach Hebrew to immigrants. The style uses only Hebrew and focuses on basic vocabulary around holidays, traditions, culture and common words. You’ll be using your PC to log in to a virtual classroom and are required to actively participate in the lessons in order to create an intimacy between you and the language. The service uses video conferencing technology so you can see your professor and any multimedia they want to use to teach the lesson. Your teacher will always be a certified Hebrew instructor and will only give instruction in Hebrew. According to the company, eTeacher materials include videos, PowerPoint presentations, images, text and some pre-recorded audio. Most of these are made available for you to download after a lesson, though some come to you before the lesson plans start. These materials as well as lectures make up part of the assessments, drills and comprehension services provided by eTeacher. This setup means you’ll have homework! A headset to connect to your PC. Hebrew letter stickers to add to your keyboard so it serves as both an English and Hebrew keyboard. Your computer screen can be shared with the teacher or class, that way the class can research topics or surf the Web together to find real-world examples of lesson materials. If you have a webcam, you can also turn it on so the teacher can see you during class. Homework checks by staff members. These are returned through the company’s system and may include downloads to check workbook problems. The company offers a wide variety of language packages for complete newbies or children through native speakers that want to learn specific Hebrew dialects or have a historical understanding of the occasion. How do I know if this service can be helpful for me? How to choose the right plan/level? The company recommends using its website or phone number to contact the support staff in order to sign up for the most appropriate class. eTeacher offers 5 different levels of Hebrew instruction as well as two courses specifically for children and courses on Biblical Hebrew, Aramaic and Yiddish. Each course has two intensity levels, one that meets twice a week for nine months and the other that meets once a week for eight months. Courses cost roughly $1,200, but costs are finalized when you sign up and may differ from that estimate depending on the schedule and availability. Hebrew for Adults 1: This course is for adults who do not know any of the Hebrew language. It focuses on simple reading and basic vocabulary for speaking. The end-goal is to have students learn roughly 500 words and be able to hold basic conversations in Modern Hebrew. Hebrew for Adults 2: This course is for adults who can already hold a basic conversation in Hebrew, know the alphabet, and can write short sentences. The course teaches more advanced lessons such as expressing feelings, using correct grammar, and learning to write short sentences and essays. Hebrew for Adults 3: This course is for adults who can hold basic conversations in Hebrew as well as read and write a variety of texts; it is mainly for improving fluency. Students will learn how to express themselves clearly, read and write complex sentences, understand complex grammatical structures, and improve their vocabulary. Hebrew for Adults 4: This course is for adults who can converse in Hebrew easily and read items in Hebrew newspapers and websites. This course works on developing a deep vocabulary, write complex sentences and texts, learn Israeli culture, and master Hebrew structure. Hebrew for Adults 5: This course is for adults who can freely read, write and speak in Hebrew about a wide variety of topics. The course teaches adults how to surf the Web in Hebrew, expand their vocabulary in specific niches, learn new terms popularize in pop culture and media for Israeli journalism, and read an entire Hebrew newspaper on their own. Hebrew for Children 1: This course is for children aged 7 to 16 (classes are spilt among ages) who have no prior knowledge of Hebrew but can read and write in their own native language. It will teach students roughly 500 words, basic alphabet and sentence understanding, and simple conversations for special occasions like holidays. Hebrew for Children 2: This course is for children aged 7 to 16 (classes are spilt among ages) who have exposure and some understanding of Hebrew but it isn’t their native language. Students learn basic expression, simple writing, conversations, and grammatical structures such as present and past tense, prepositions, and verb conjugation. There are many positive reviews around the Web for the teachers themselves. If you accidently sign up for a class that is too advanced or too simple, eTeacher will move you to the appropriate class at no extra charge. It offers a wide range of courses that can be tailored to your experience. Students have found the forums and homework checking to be very helpful and have prompt responses. Tech support is highly recommended by users. Study materials arrive well before classes begin. Courses make language learning difficult but fun. There are opportunities for one-on-one learning. Instruction is only in Hebrew. The company claims to be the exclusive holder of the Israeli Ministry of Foreign Affairs’ franchise to teach Hebrew online and have associations with the Hebrew University of Jerusalem, but reviewers around the Web are sometimes unable to confirm this and do not get credentials or certificates mentioning either group. The website offers no pricing information and provides different course durations than its phone customer support. Enrichment sessions are listed as complimentary but are actually counted as sessions you pay for when figuring out the price of a course. Some users report having teachers from the United States and other countries despite the eTeacher website saying all faculty members currently live in Jerusalem. • Are there free eTeacher learning materials? • Who are the teachers? The service says all teachers are native speakers who live and work in Israel, and have college level degrees in language instruction. • How do I know what level I should start with? The service recommends you call or fill out an online contact form to evaluate your skill level with a counselor. • What are the advantages over independent learning programs? eTeacher says the advantage is a combination of live online sessions plus support in answering questions and correcting pronunciation that independent programs don’t offer. • What if I need additional assistance with my homework? The service offers a forum for asking questions as well as a homework review service. You can also setup personal sessions with your teacher. • What if I miss a class? In case you miss a class, all of the lessons are recorded and kept on the company’s servers so you can watch them at your convenience. 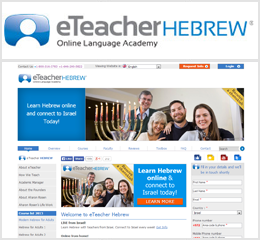 eTeacherHebrew offers a very compelling strategy to teach Hebrew. The virtual classroom combines many strong elements of participation and various lesson plans while allowing you to be comfortable as you learn. Immersion programs that teach foreign languages only in that language are consistently shown to provide better results than bilingual learning, but this can be off-putting for some new users. The only difficult part of the process is nailing down the cost of your program. The company’s website offers differing estimates, but phone representatives can provide a final cost, which were told is around $1,200 per course. This entry was posted in Reviews. beware of this company, I told them up front I had learning disable and said would not be issue, They lie about that, also I try to get after two course, they force me pay in ful with out the course, So they rip me off over 1,000 dollars and I really did not have that type of money to waste, They did not care and they are just about the money, buyer beware, When I said the class we had 25 student I was told only two stay for end of the course. that is pretty sad for company claiming all that they do. Eteacher.com is a ripoff. they told me I could learn Ashkenazic Hebrew yet they only teach Sephardic. When I complained they changed my class to a different teacher but still taught in Ashkenazic. When I tried to cancel on signed up under false pretenses eteacher charged the balance on my credit card. An unauthorized charge. It took me a long time but finally got money back through the credit card company. If any one signs up they deserve what they get. When I signed up could not find reviews telling how bad this organization truly is. Now a little searching gets lots of results to warn others. I have taken etearcherhebrew over the course of at least 3 years. I am reviewing Ulpan 2 again. Regarding pricing, you SHOULD haggle with them. Yes, there is no pricing advertised on their site primarily because there is no fixed pricing and so their pricing is very flexible. They will typically tell you that they are making a special offer for you just for today, but you should haggle with them and simply say that you can’t afford it. You can always call again and get a different support rep and do the same. Additionally, you should study on your own as much as possible. The review is incorrect in saying that the courses are only in Hebrew. What happens is that too many of the students are unprepared when attending a given class (simply lazy), and the teacher spends too much time explaining things in English. Finally, I would not depend on just one live hour a week to make progress. I also subscribe to hebrewpod101.com, listen to Pimsleur Hebrew (excellent), use doitinhebrew.com, and refer to my other Hebrew learning resources to study as much on my own. eteacherhebrew additionally has “open class” throughout the week that I attend, and I listen to and save as many of the advanced levels as possible. Don’t trash your money ! I enroll in the hebrew class with them. I did ulpan 2 and ulpan 3 with no problems, I loved my teacher and I really learned a lot with this program. However, in spite of being a good customer already, they decided to give me hard time and to mess up with me. To explain you the problem, basically, They called me in july to know if I wanted to continue to ulpan 4 which I answered YES but not before december and I want to continue with Etti and no other teacher. Therefore we closed it and I bought the ulpan 4 and they told me they gonna contact me to choose the schedule. They tried to contact me over the phone in november to book me for a class in november but they couldn’t because I was in israel that month so my phone line in USA was frozen. THey say that they also emailed me but I never received any of those emails. At the end, they enroll me in a class in november without my consent which is not a class with my teacher either. They called me in february to ask me what is going on, I didn’t attend any of the classes since my ulpan started but obviously I wasn’t aware of it which I stated. After several calls and arguments with them, they dont want to put me on another ulpan 4 unless I pay again for it. I didn’t even ask to be refunded, I just want to take my classes but it seems hard. They are going around the problem, saying that they did whatever they needed to do in order to reach me but they couldn’t. bul… They are just trying to get away with it like that. That s the israeli way. They dont even want to give you the name of the supervisor, not willing to do anything. I was so pleased with those classes but honestly Im so disappointed of them and how they handle this kind of things. I could continue with them until the last ulpan which means 3 other more courses but they blew it up. Bottom line, Stay away from them. It also installed numerous adware. It took me a day to clean up the mess (I am a programmer). Of course I have no intention to visit this site ever again! I asked for credit that after a week was not yet issued. There is little interaction aside from reviewing a basic “study yourself guide” without any of the help a study guide would provide. There are answers to homework but never time to discuss the issues. Some instructors are awesome, and some only know the words. For this price, purchase a do it yourself book, and visit a synagogue. This Company EteacherHebrew is a BIG SCAM, stay away from them! They will robber you! I asked for the cost of tuition and not to call me but email me the information. Instead she, Debora Davis repeatedly and aggressively called me and sent me multiple emails but without telling me the costs of tuition. When i refused to engage with her, she asked her colleague to email and call me. Amazing way of bullying your ‘almost’ potential clients. I reported their email as spam and now trying to stop their phonecalls. As my suspicions grew, i started to google them for reviews and found your site. I hope people will find your site first before they commit with them. Sadly, they are giving Israel and the Jewish people a very bad name. Don’t waste your money on these guys! simply waste of TIME! teachers are NOT native speakers! Skyvrit Academy is great and affordable, also,hebrewpod101.com, Skyvrit has a great social network for learning Hebrew learninghebrewonline.com which you can use as well. Enthusiastic teachers, good customer service about technical matters, good course material but a sad lack of listening material. They provide 3-4 minutes of dialogues to listen to at the lower levels but as of level 4 (halfway through the course) instead of providing more, there is suddenly NO recorded educational material (dialogues by native speakers, oral grammar exercises) to listen to outside of class. I lost my husband and decided to cancel the course 3 weeeks before it supposed to start. I was not able to follow schedule and I was too expensive for me to take care about 5 children and study. The company advice me to move course for the future time. Unfortunately miracles did not happen and I was not able to study. The company charged me $830 CAD for no one lesson and I got a very aggressive letter from their representative that I still own them $168 and my case is in a court now. So in general I did not get any classes any services and be charged just becouse I was not able to study. Dear students, if you are looking for the company to study than find one which provides free first lesson and try to help you , not to charge in advance. The amount is not big enough to take the lawyer and that’s why they take advantage and charge you. They are not struggling for clients, they are looking for not well informed people to charge them for nothing. Be careful and protect yourself. Thanks. ..so far I’m happy with it. LearningHebrew.net © 2012-2019 All rights reserved.